The Highlighter is the run down on the best resources The Falvey Library has to offer. 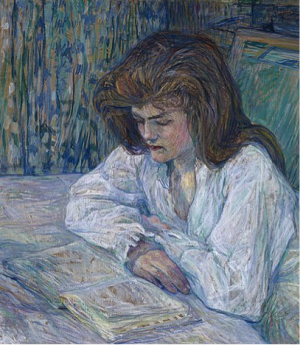 La Liseuse by Henri de Toulouse-Lautrec, 1889. Peinture à l’essence on board, 68 x 61 cm. Courtesy of Wikimedia Commons. Although they were first introduced over two decades ago, academic monographs in digital format took longer than expected to establish themselves in academic library collections. After much experimentation with various business models, academic presses today are releasing an increasing number of titles in electronic format. Scholars in all disciplines are likely to have “opened” an e-book from their library’s holdings. Occasionally, the Library has print as well as electronic copies of a monograph. In some cases, the Library has multiple records and links for a single monograph allowing access to the same title on different platforms as well as in various formats. Because nearly all publishers today, including venerable academic presses, have become more confident about the viability of electronic monographs in their business plans and frequently offer added features and discounts, libraries, faced with diminished budgets for building and maintaining collections, are actively rethinking the place of the electronic monograph in the overall collection development scheme. Will academic monographs follow scholarly journals into the cloud? What will happen to the legacy print collections? How will libraries collect and preserve access to the scholarly output? And, what will the library stacks look like in twenty years? These are just some of the questions that libraries will need to answer in the coming years. Legacy print collections, while important to the academic enterprise, are less actively used and often less accessible to scholars if stored remotely. On the other hand, digital copies of pre-1923 monographs, which are out of copyright and in the public domain, are at the fingertips of scholars through their library’s digital collections, the Internet Archive, Google Books, and Hathi Trust, to name but a few of many digital repositories. More and more academic presses such as the University of California Press and the University of Pittsburgh Press have released out-of-print legacy collections as open access digital collections while others have digitized their legacy collections to monetize them in commercial packages. Faced with a multitude of choices and confused about the evolving e-book landscape, faculty and students look to the Library for answers to their questions. Alas, there are no simple answers to most of the questions asked, so be patient and keep asking. Reach out to your subject librarian if you cannot find the answers you are looking for below. How does the Library decide which books to acquire in electronic format? Librarians select electronic monographs for various reasons including: a) e-books can generally be used by multiple readers simultaneously with 24/7 online access; b) faculty can share e-book content with students without worrying about infringing copyright particularly if it is DRM free (see next question); c) electronically available course materials reduce the financial burden of students (Affordable Materials Project); d) the print book is out of print and no longer available; e) e-books generally do not get lost in the stacks; f) e-books do not require shelf space. DRM stands for digital rights management and describes technology that allow publishers to control and limit access to electronic publications in ways that they do not control and limit access to print publications. For example, DRM allows a publisher to limit the number of pages you can download or print from an e-book. Librarians are wary of DRM and prefer DRM-free licenses, if available. Can I read the Library’s e-books on my tablet? It depends largely on e-book format and limitations imposed by the publisher. In most cases you should be able to read the Library’s e-books on the device of your choice. For those who like the Kindle experience, there is a Kindle app for smart phones and tablets. Other popular e-book readers include the Apple Books reader, the Bluefire reader, and the Adobe Digital Editions reader. Many library e-books can be read within your web browser or via Adobe Acrobat Reader. Can the Library purchase all monographs in my discipline in electronic format? Currently this is not possible for the following reasons: a) There are still some books that are only published in print, while others have a short embargo (comparable to the embargo for paperback publications) until the electronic version is released to protect the print market; b) occasionally libraries are barred by the publisher from acquiring electronic editions of books, typically mass market books and textbooks; c) the price of electronic books may be considerably higher than that of the print version; d) the e-book may only be available as part of a package or “big deal;” e) license restrictions attached to the use of e-books may be unacceptable. Why not get all e-books through JSTOR? JSTOR is a popular platform for e-books and the Library agrees that it would be great to have all e-books on one platform. However, only a limited number of scholarly presses have adopted JSTOR as their access and distribution platform. Among them are publishers such as Princeton University Press, which added part of its legacy collection in addition to new titles. Nevertheless, JSTOR does not have all Princeton University Press titles. Publishers still limit access to selected titles to print to protect their print market or because of restrictions imposed by authors. Are there any financial considerations that come into play when deciding between print and electronic monographs? The simple answer is yes. The more nuanced answer is that the financial considerations depend on various internal and external factors, among them the price differential between print and electronic versions and the availability of the monograph for single-title purchase. The Library has embraced the University’s Affordable Materials Project and will purchase electronic copies of assigned course texts as long as they are reasonably priced and available in electronic format. Does the Library own all the e-books listed in its catalog in perpetuity? No. E-book access is negotiated and licensed in a multitude of access models ranging from subscription without any ownership rights, to purchases based on actual use, to an ownership model comparable to print collections. The JSTOR e-book collection, for example, consists of three access models: a) The Library has access to legacy collections through a consortium of mid-Atlantic libraries for a comparatively moderate fee; b) the Library has access to JSTOR front-list titles (the last 3 years) and acquires all books from this list that have been actively used at a steep discount; c) the Library owns in perpetuity access to numerous JSTOR books that it has acquired over the years. Why would the Library commit to anything but permanent access? Primarily to maximize the number of publications it can offer its constituents. Permanent access is neither always offered by the publisher nor always desired by the Library. For example, consider how-to manuals in computer sciences which have a relatively short shelf-life. Is there an easy way to find or browse e-books in the catalog? It depends on what you are looking for. Books & More search results can easily be limited to online resources in the Library’s catalog. Ask a librarian for advice as e-book collections are often subject or discipline specific. Take Books 24×7 for example. This package is great for the sciences, especially computer sciences, but has little to offer for the social sciences and humanities. While it is theoretically possible to browse some of the smaller collections, such as Cambridge Histories Online, it requires some expertise to do so and most patrons are better off going directly to the e-book platform via Databases A-Z. Most e-book records in the Library’s catalog list the e-book publisher or platform as additional author, which means that an author search for “Loeb Online” will result in a list of 209 records for close to 400 e-books in the Loeb Classical Library series. What are the biggest e-book collections and packages available at the library? By far the biggest collection is the multi-disciplinary ProQuest e-Book Subscriptions collection with 133,839 titles. The Library does not own the e-books in this collection but may purchase those that are heavily used. This collection also has considerable overlap to the Library’s print collection. The second biggest collection is the SpringerLink collection with 42,113 titles, followed by JSTOR e-Books (43,849 titles) and the Books 24X7 collection with 15,968 titles. Among the medium sized e-book collections are the OECD iLibrary (7,646 titles), ACLS Humanities e-Book Collection (4,387 titles), and Literature Criticism Online (1,832 titles). Smaller, but noteworthy because heavily-used, are most of the humanities e-book collections, among them Oxford Handbooks Online (389 titles), Cambridge Companions Online (634 titles), Cambridge Histories Online (377 titles), Cambridge Books Online (300 titles), the Duke Gender Collection (532 titles), Project Muse e-Books (341 titles), and Taylor & Francis Books Online (317 titles). Worth mentioning is the growing number of open access e-book collections, which include MetPublications (353 titles), the Open Textbook Library (462 titles), and University of Pittsburgh Press – Digital Editions (642 titles). Records and links for the collections mentioned above are available in the Library’s catalog. The Library’s substantial digital collections of pre-1923 imprints deserve a special mention. Together they deliver access to an impressive body of scholarship. The biggest collections in this category are Eighteenth Century Collections Online with over 130,000 titles published during the 18th century, followed by Early English Books Online with just over 100,000 titles published from 1473 to 1700, the Making of the Modern World with nearly 60,000 titles and Sabin Americana with just over 40,000 titles. The two series of Early American Imprints comprise together over 73,000 titles. Works in these collections are fully cataloged and easy to find while they can also be accessed via the collections’ proprietary interfaces.